Hi everyone! 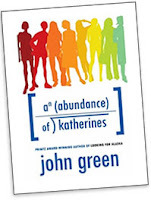 For my author study, I am going to focus on the young adult author John Green. He writes books that are best suited to students in grades 8 and up, mainly because he does not shy away from difficult subjects and language that captures the reality of how many teens speak today when they are with their friends. Just about everything that you need to know about John is available via his website at sparksflyup.com. 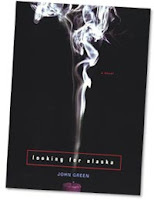 John's best known work is a novel called Looking for Alaska. It won the Michael L. Printz Award for excellence in Young Adult literature, was a finalist for the L.A. Times Book Prize, and received many other accolades, which are discussed at some length here. His new novel is called An Abundance of Katherines. Katherines was a Michael L. Printz Honor Book and was also a finalist for the L.A. Times Book Prize. It is a great piece of fiction, very humerous and deep and suspenseful. Above all, it is very quirky, much like John himself and all of his fiction thus far. To get a better perspective on John's quirkiness, check out the video below. Its part of a larger video blogging project that John has been doing with his brother Hank all this past year. The name of the project is Brotherhood 2.0. As you can see from this video, John is still pretty young. He just turned 30 this past week, actually. So the above two books are his only novels. But he has an extensive background already in writing for journals and various newspapers, for National Public Radio, and now on the web via his blog. Its hard to say what motivates John to write his novels. This is a question that he would, by instinct, avoid answering with any seriousness. John likes to keep coy about his emotions and thoughts, and let readers draw their own conclusions. My sense is that John is simply a very talented writer with a great deal of sensitivity to the world, to language, and especially human relationships. It is interesting that for a while he was a student chaplain in a children's hospital; he is very interested in questions related to religion and spirituality, and I think he writes to explore these questions and find answers. He also clearly enjoys taking "nerds" (like himself, I think he would say) and putting them in situations where they are challenged, sometimes beyond their capabilities. I suspect he has always identified with people who feel on the margin or fringe of society and school, and his books appear to be an effort to let these people know that their feelings and preoccupations are good things, though not all that there is in the world. Or, perhaps, John just watched too much Pee Wee Herman as a young child. In any case, John Green's literature draws me in with its humor and seriousness, and with its clear desire to play with words and ideas, and celebrate the capacity of people to overcome their fears and learn to love themselves and others. This is why I read John Green, and I hope you will too. Looks like John Green has quite a sense of humor. I too have interests & questions about spirituality. I will have to check out his books. Thanks for inviting me. That video was pretty funny and a little gross. I think I could almost taste the horse radish myself. It reminded me of an episode of reality television. He seems like an interesting author, I too will have to check out his work. Thanks for the responses, Heather and Traci. I'm looking forward to seeing how this site develops. At some point, when you have a moment, I suggest others reading this blog try out actually drafting a post for this blog. To do this, you first have to sign into blogger using the id and password you created. Then, click on "New Post" when you "Dashboard" appears, listing this blog. If you don't want others to see yet what you have written, just click "Save As" after you are done writing. This will save your posting, and you can go back to it at another time to revise and finalize.